The story is emblematic of Cheung’s fascination with cities and his hometown. His work delves past Vancouver’s typical headlines, from a feature on a 24-7 donut shop to a story about a mass wedding at an East Vancouver church. He harnessed that passion during his time at UBC Journalism, working for local outlets such as The Tyee and Vancouver Courier, and producing a thesis on the children of Vancouver immigrants. What is your current role and what does your day-to-day look like? I work at The Tyee and do the social media there. I also package stories for the web. If you go on the site, you’ll see there’s lot of pieces to it. We’ll have photos, a poll or a video. That’s one of my stable gigs. I get to work out of the newsroom every day, which lets me pitch stories easily. Once in a while, we’ll get funding for projects. I just came off one year of doing housing reporting for a project called The Housing Fix, which focuses on housing solutions beyond what you might see in day-to-day headlines. We dig into a lot of policy and read a lot of academic papers. I’ve also got two other regular freelance gigs. In the Vancouver Courier, I have an ongoing series called Vanthropology. I hang out with somebody and write about their place in the city. And I’ve got a story in Metro Vancouver every Friday as part of another ongoing series. This one’s called Urban Scrawl, and I’ve written about everything from the hidden history of the Vancouver Special, teens who break into high-rises to get on the rooftops to the gentrification of the Vancouver region as middle-income neighbourhoods vanish. Your stories are largely centered on life in Vancouver. What fascinates you about the city? I grew up here. A lot of my friends in high school got their driver’s licenses right away. I failed my test six times. I got it three years after everyone else, so I bussed around a lot and that led to me exploring the city in a slower way that you don’t get from always being in a car. I like taking photos, too, so that was a fun way to document different neighborhoods. I think being able to do this kind of journalism is just an excuse for me to find out more things about the city I love. For example, I did this story on a 24-7 donut place on 41st and Knight. It’s called Duffin’s Donuts. It’s at a weird crossroads because it gets a lot of people who wander in at night after partying. But it’s also on a route that attracts a lot of truck drivers. The place has a funky menu with some typical diner stuff. But there’s also Salvadoran compusades and southeast Asian food. There’s also surprising flavours of donuts that you don’t see at Tim Hortons. It turns out the place is run by refugees who left Cambodia. For a time, they lived in Los Angeles where there are a lot of Cambodian refugees. While they were down there, they learned about the donut trade, which is kind of ubiquitous for Cambodian immigrants, in the same way that diners were for Chinese immigrants in North America. They eventually brought it here to Duffin’s Donuts. So journalism is being able to ask questions and satisfy my own curiosity. How did you get into reporting? I did my BA in English literature and I thought I was just going to be a teacher. But I ended up falling in love with sociology. I took courses in the sociology of the built environment, of consumption, of communities, and I also studied with a professor that wrote a book called There Goes the Gayborhood?, which was about the evolution of gay neighbourhoods as their respective cities gentrify. All of that, plus my love for all things urban, taught me about city-building, the ingredients of a vibrant neighbourhood, how to make them inclusive and investigating who holds power. So along the way I decided it’d be worth it to do a sociology minor. Everything I learned fascinated me and helped me better understand Vancouver. I’ve always wondered why certain neighborhoods change. How come all of these Filipinos shops have vanished? How come all the new businesses moving in have exposed brick and wood and are really expensive? And how come so many people are drawn to that aesthetic when they spend money? Those courses really gave me a lot of tools to unpack what was going on. I’ve always really liked talking to people and photography. The idea just popped into my head to apply to the journalism program. So the summer before I was about to start UBC Journalism, I emailed all the papers in town, asking if they would take me on just to get a little bit of experience. Everybody said no. They said you need to have some experience first. Or you’re not allowed to come to us independently without a school internship. But one editor was really nice at the Vancouver Courier. He decided to give me a chance and let me write for them. I was there for 13 weeks before I started school. Being at that kind of neighbourhood paper was a nice initiation into journalism. I did a lot of writing and learned how a newsroom works. Why did you choose UBC Journalism? I grew up here, so I wanted to stay here. Also, the idea of being able to do a thesis was really exciting. There was good support from the professors and instructors. A lot of them teach, but many are still in the field. It was nice to have people teaching you who are really plugged in to what’s going on. There’s such a diversity of courses, too. Nobody knows where media is headed, so UBC wanted to prep us as best as they can. There was advanced interviewing, learning how to do feature writing, video, social media. All were good tools to add to our toolbox. Your thesis also focused on Vancouver. What did you look at specifically? Because Vancouver is part of a network of cities on the Pacific Ocean, it tends to attract a lot of migrants. I wanted to look at what it was like for children of immigrants to be part of two different worlds. There’s the world of their parents, where there’s culture and traditions from overseas. But at the same time, they’re raised in a society that their parents didn’t grow up in, with more mainstream schooling and culture. How do they navigate that sense of identity? So I looked at children of Chinese immigrants over 100 years. There were five eras to my thesis, starting from what it was like to be part of the tiny but bustling Chinatown enclave. 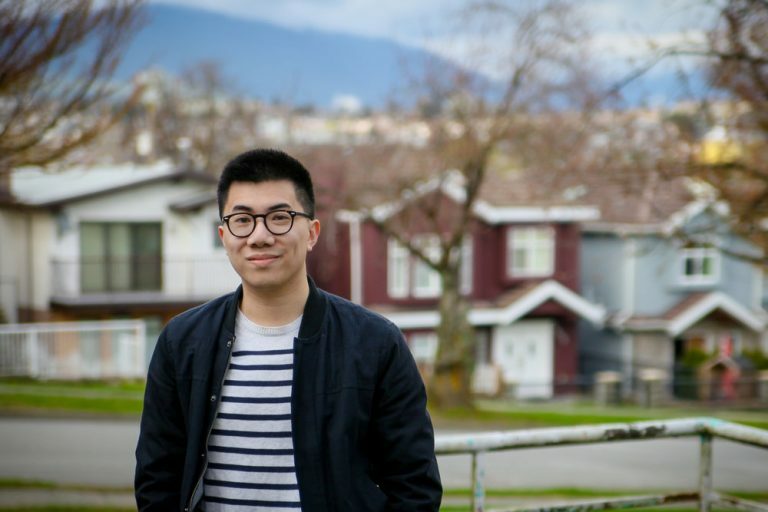 And it ended with the most recent era with young people who grew up in Vancouver’s neighbouring suburb of Richmond, which has a very high immigrant population. What was it like collaborating with an advisor? I appreciated how the journalism school wanted us to have a secondary advisor who is in the field of whatever you’re researching. I worked with a professor named Chris Lee who specializes in diaspora literature. His insights really helped. It was hard doing a huge project because you do so many interviews and so much research. That’s why I appreciated having to have a literature review as well. You start to understand how journalism and academia work together and how to use the literature in your story. I learned the importance of collaborating with scholars and the importance of immersing myself in the literature of a beat. I still read a lot of papers today as a mental work out. It sounds like extra work, but like exercise, the more you get used to doing it, the more enjoyable it is. I also had to learn about what to include and exclude in a story. I know it’s really tempting to include all the quotes from everybody you talked to. But you’ve got to focus on what your story is and really only include what services your story. Incoming students often ask about what they can specialize in or what their thesis can cover. What’s your advice? Make sure it’s something you love because you’re going to be immersed in it for a really, really long time. What was the biggest takeaway from your time at UBC Journalism? There’s good support at the school, but at the end of the day, it’s up to you to make what you want out of this degree. All of the instructors are available and are more than happy to work with you. But you really have to go out there and talk to them. What did you end up doing after graduation? Did the School help you land any opportunities? For my official internship with UBC, I was at The Tyee for three months. I got the offer to do the social media job for them before I finished school, so I worked there during the last term. As they got more work, they gave it to me. What are your fondest memories of the School? There was a lot of day-of projects where we forced to interview people on campus. We’d be scrambling, running around campus, trying to compete with each other. I thought those were really fun. I enjoyed the adrenaline. Any words of advice to students considering UBC Journalism? If you’re worried about the future of journalism, go for it anyway. People are always going to need information and smart resources they depend on, so don’t despair. Whatever you’re passionate about, find ways to explore it. You really need that go-getter attitude. All the resources are here and it’s great that UBC provides that for you. But you’ve got to dig deeper and make the best out of your education. Don’t get bogged down by the doom and gloom in this industry. It’s an exciting time to do journalism.